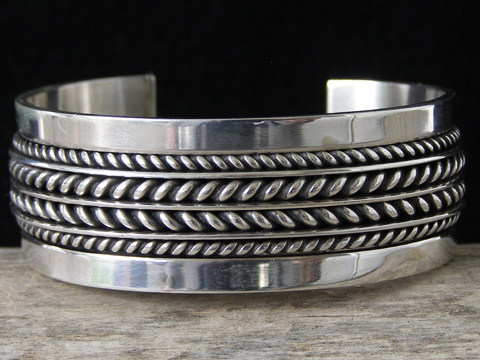 Ron Yazzie Sterling Overlay Twist Wire Bracelet size 6 5/8"
Ron Yazzie is a Navajo silversmith who specializes in highly polished Sterling bracelets made from component parts of Sterling wire. His signature stylistic element is one or more rows of twisted wire or braided wire wrapped horizonatally around the bracelet's surface. Ron's bracelets are built on a foundational layer of sheet Sterling to lend strength and durability to his pieces. This uniform-width bracelet has four lengths of roped wire wrapped around its surface. Buffed to a high polish, this cuff is simple and elegant. Ron hallmarks his pieces as Tom Hawk. Stamped Sterling inside also.